A high ceiling arm with relief risk. An emerging power hitter drafted in the 15th round. 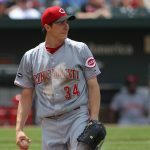 A 22 year old that destroyed Rookie ball pitching. These three Jays prospects have my eye in 2019. 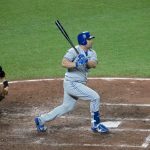 Last offseason I profiled some prospects to watch in 2018. 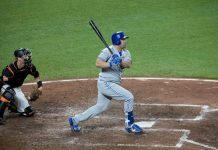 The focus was on players who were close to the major league level, or who had already gotten their cup of coffee. This year I’m going to look at two prospects who are farther away. As such, the risk of them not doing what we hope they will do is higher. 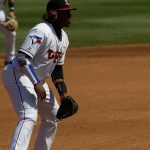 But these players are good examples of the talent percolating at the lower levels, overshadowed in a system dominated by Vladimir Guerrero Jr. and Bo Bichette. The Jays’ farm system is ranked very highly by most outlets, but it’s largely on the basis of a top heavy group. 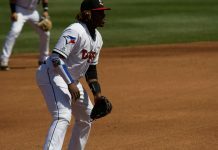 Vlad Jr., Danny Jansen, and Sean Reid-Foley are in line to lose rookie-eligibility this year. Bichette will presumably no longer be considered a prospect by 2020 at the latest. With several of the team’s top prospects graduating, rankings of the system will drop. So with the Minor League Baseball season starting today, it seems appropriate to try and identify some risers in 2019. Part of the return in the Roberto Osuna trade, Hector Perez throws a mid-90s heater (and higher in shorter stints), a slider, curveball, and splitter. All four pitches flash plus or better and have natural movement. The problem is his command and control. He walked 5 batters per 9 innings across two levels last season. He doesn’t have the smoothest mechanics and can lose his release point at times. The upside is so tantalizing, though. A career-high 12 strikeouts in 6.2 innings on June 8th with Houston’s Advanced-A affiliate being an example. Even when his secondary pitches aren’t working well, his fastball gets him by. A slider with late movement and a plus fastball should give Perez the floor of a late-inning reliever. 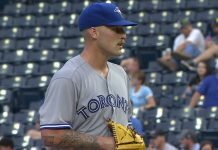 But the Jays have him starting the year in New Hampshire’s rotation. Harnessing his secondaries and lowering the walk rate will be key. I hate making predictions for young pitchers. There is so much that can go wrong. That said, I feel fairly confident that Perez will log major league innings at some point. His development in the coming months will help determine when, and in what capacity, those innings happen. Realistically, his future role is in relief. FanGraphs puts a 30 present value and future 40 value on his command, both below average. 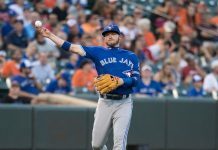 Perez could still be a useful weapon to close out games for the Jays one day. Or maybe in a more creative way, pitching every three-to-four days as someone who follows an “Opener”. Curiously, the rebuilding Jays have acquired several low-ceiling players in trades recently (Derek Law, Forrest Wall, Julian Merryweather). Hector Perez, however, is of the high risk-high reward variety. There is a wide range of outcomes. Don’t scout the stat line for Perez this season. Being able to repeat his delivery and improve his command is what’s important. He also has a two-seam fastball he’s developing. 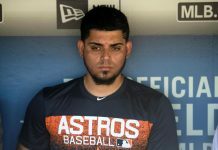 The transition from the Astros to the Blue Jays should be relatively smooth, as both organizations share similarities in the way they gather and share data with young players. 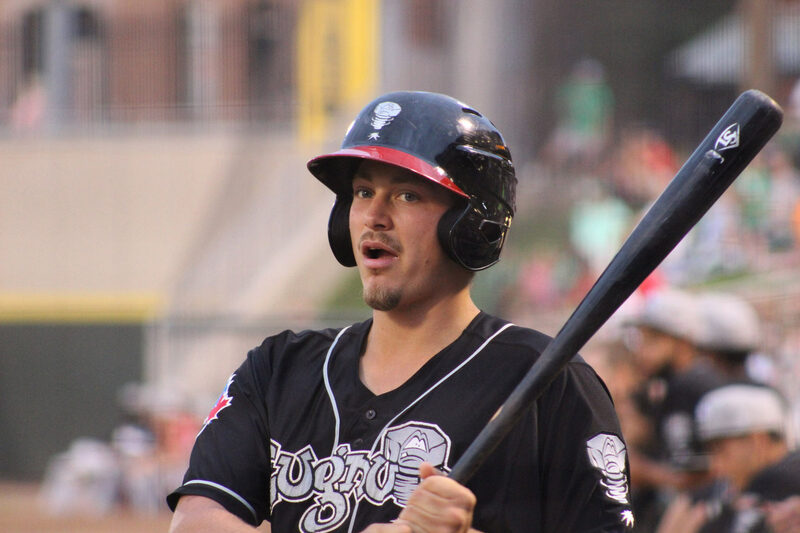 There were 175 players in the Midwest League to accumulate 200 plate appearances last year. Ryan Noda’s 160 wRC+ ranked 3rd best, behind Twins prospect Alex Kirilloff’s 176 and Noda’s teammate Kevin Smith’s 190. It’s worth noting that Minor League wRC+ on FanGraphs is not adjusted for ballpark factors as it is for Major League players. Despite that, it can still be an indicator of success at the plate. While Lansing is a launching pad for doubles and triples, it actually depresses home runs according to StatCorner data. Noda’s 18.7% home run-to-fly ball ratio doesn’t scream freakish luck, and he put the ball in the air more often than most of his teammates did. There could be legit power potential here (more on this later). Noda’s plate discipline was also on display as his 20.7% walk rate led the league. His 0.81 BB/K ratio ranked 8th best. These are fine stats, but Noda is a 22 year old in Low-A ball. That’s not meant to sound like a backhanded compliment, but more so to provide context. 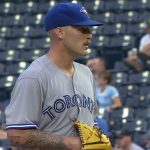 Next season he will be at a level(s) where stat lines can crater (for a recent example, look at Jays’ prospect Bradley Jones’ struggles after a promotion from Lansing to Dunedin in 2017). That walk rate is sure to come down when he faces pitchers who know where their pitches are going and offer better secondaries. His patience at the plate will be tested, and more swing-and-miss could erode his power numbers. I gathered Minor League data for balls put in play via MLB Pipeline’s Prospect search. 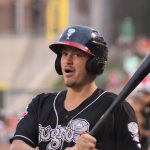 I then calculated estimated home run distances for Lansing Lugnuts players in 2018. Ryan Noda made six appearances in the top 14 spots on the leaderboard. So while ballpark factors at Lansing raise some questions, we know for a fact that Noda performed very well relative to his peers. His bat-to-ball skills and patience at the plate. His .511 OBP led all Rookie-level hitters with 250 or more plate appearances last season. Same goes for his 1.034 OPS and 181 wRC+. And his plate discipline was bananas. He walked at a rate of 2.7 times for every strikeout while only two other Rookie-level hitters even managed 1:1 BB/K ratios. Stevenson’s 4.1% swinging strike rate also led his level. The only other hitter with a whiff rate under 7% was Tampa Bay Rays super-prospect Wander Franco (6.2%). The obvious caveat here is that Stevenson is old for Rookie leagues. He was drafted out of the University of Arizona and turned 22 years old in September. The jump from college senior to short-season ball shouldn’t be too challenging, so a real test will come as he moves further through the system. But those numbers are still exceptional. Given the state of the major league team in those areas, I’m hoping he reaches the big club for that reason alone. If that happens he’ll most likely top out as a 4th outfielder. But there’s still time for the organization to make some swing changes and try to unlock more power. If they can, Stevenson could become a lot more interesting. Defensively, Stevenson played all three outfield positions in 2018. His future looks to be in centre field, where he’s able to cover a lot of ground. He starts the year with the Dunedin Blue Jays tonight. It’s worth keeping in mind that Stevenson’s impressive batting average last season got a bit of a bump from 10 of his 29 ground ball hits being bunt singles to the third base side. Teams in the low minors are utilizing infield shifts now more than ever, and to Stevenson’s credit he found a way to beat them. But from a developmental standpoint I’d rather see him swing the bat, especially now that he’ll face stronger pitching. He’s a fresh face in the system with a limited ceiling at present, but he’s also one of the prospects that intrigues me the most because of his hit tool.